As you can tell, I'm a chatty person. I like to share information about reading, writing, and being an author. 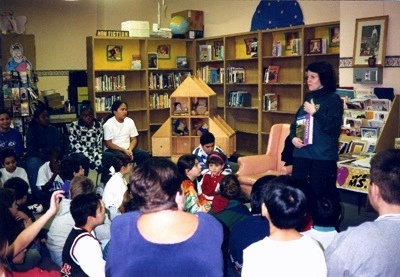 I've been to teacher conferences, professional group meetings, libraries, and schools across the country telling young and old about the joys of writing and reading books. If you'd like me to visit with your group, I'd love to come. Since I write for preschoolers through adults, I feel comfortable speaking with any age reader. Of course, the smaller the size audience the more comfortable participants usually feel asking questions and making comments. At schools, students like being with a couple classes in a cozy school library. But any size group in any setting works for me. Just let me know, so I can bring visuals everyone can see and enough bookmarks for kids or handouts for adults. I also conduct writing and other educational workshops and take requests, targeting information to different audiences. Student presentations last between 30 and 60 minutes, depending upon the age of participants. Presentations have different focuses for different grades. Presentations come with lots of visuals, from a map, blownup pictures, and gross tooth collection to a slide/powerpoint presentation. I can usually give four presentations per day without getting too tongue-tied and forgetting my name and who I told what. My fee varies according to the number of days involved and whether the workshop/presentation requires an overnight stay or not. Requestors pay all travel costs in addition to my fee. I GUARANTEE YOUR GROUP WILL HAVE FUN AND LEARN SOMETHING, TOO! Copyright© 2019 Marlene Targ Brill. All rights reserved.